Pop colors dance off the page of this 1965 display! 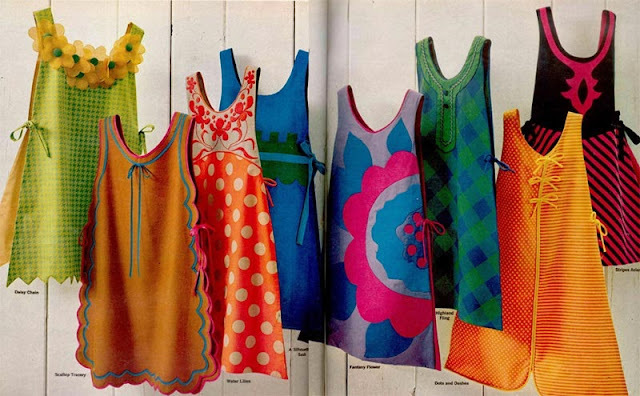 This summery spread from a vintage Woman's Day magazine looks like sun dresses, but it's actually tunic style aprons. If you look closely, each "dress" has slit sides with string ties at the waist, though vintage aprons like these can easily convert to daytime dresses with simple seams or cute layering. Add a chemise style dress or a tank & bloomers for a cheeky effect. Names (from left to right) are Daisy Chain, Scallop Tracery, Water Lilies, Silhouette Sash, Fantasy Flower, Highland Fling, Dots and Daisies, and Stripes Aslant. Brilliant styles from the bubbly 1960s! Photo Source: Woman's Day, September 1965.